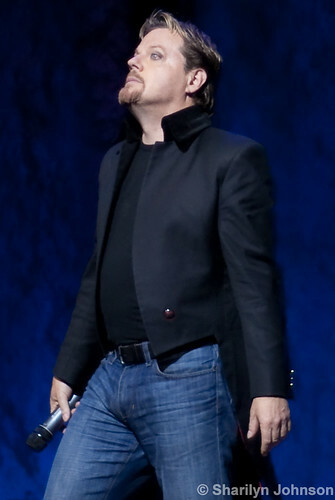 Eddie Izzard at Toronto's Massey Hall. From even the requisite Canadian references off the top (“Thank you for World War II. Nobody ever says that, do they?”) Izzard was his regular top-of-his-intelligence self, downplaying his recent marathon of marathons as being “nothing” compared to Terry Fox. He told us he doesn’t believe in God, but he believes in us, in humanity. That didn’t stop him from reenacting biblical touchtones like the animals boarding the arc and the genesis of the ten commandments. From the creation of Earth, to dinosaurs, the development of language, the Spartans, the Egyptians, and more, Izzard mixed his never-dry lessons with oddly perfect tangents about Shirley Temple, updating iTunes, and yes – bees. Performing for about two hours and 45 minutes – minus a 20-minute intermission – his recent marathon project no longer seems as unfathomable. Your photos are EXCEPTIONAL. Thanks for sharing! Thanks for posting these shots! Eddie is such a terrific performer. You captured his energy so well. Pingback: Third Beat » Breathing pure comedy: suffocation risk?